Police have identified the suspect wanted in a killing spree over three locations in Montgomery County this morning that has left 6 dead and 1 seriously injured. 35-year-old Bradley William Stone of Pennsburg, PA, is currently on the loose and should be considered armed and dangerous. Stone is described as 5' 10", 195 lbs, with a red/auburn beard and mustache, and closely cropped hair. He could be dressed in sand or green military fatigues and may use a cane or walker. People in the Pennsburg area should remain indoors. Anyone with information about the whereabouts of Stone should call 911. UPDATE 7:45 p.m.: The Montgomery District Attorney says that Stone was clean shaven last night and has released a new photo. (see below). UPDATE 9:00 p.m.: There are now reports of suspected sightings in Doylestown, PA, in Bucks County. There are choppers in the area and police K-9 units are searching. Police are telling residents to shelter in place. UPDATE 10:30 p.m.: Still on the loose. Upper Perkiomen School district closed on Tuesday. Doylestown Police say that a man walking his dog near Burpee Road and Shady Retreat Road was attacked by a man with a knife wearing camouflage demanding his car keys around 7 p.m. The victim resisted and was knocked to the ground. He was carrying a gun and fired at the suspect who ran away. That suspect matches the description of Brad Stone and prompted the police response there in Bucks County. UPDATE 12/16 1:20 a.m.: Pennsburg remains in lockdown after mayor's stay-in-shelter. The victims in the shootings all have familial relationships to the suspect. The shootings have taken place in three different locations in the Lower Salford, Souderton, and Lansdale areas. It began around 4:55 a.m. at the Pheasant Run Apartments the 100 block of Main Street in Lower Salford Twp. A neighbor heard gun shots and saw a man leaving with two children in pajamas. When asked if everything was ok, then man told the witness, 'She's hurt pretty bad. We got to leave.' Police found a woman shot to death inside the apartment. Neighbors say she is Stone's ex-wife 33-year-old Nicole Hill. The children, grade school age, have been recovered safe and sound. Stone dropped them off at a neighbor's house in Pennsburg after 5 a.m.
About a half hour earlier at 4:25 a.m., Police in Lansdale responded to a shooting at 100 block of West 5th Street. They found two people shot dead inside. They have been identified as Stone's former mother-in-law and her 75-year-old mother. Starting at 8 a.m. police discovered three more people killed in a home in Souderton. A 17-year-old male was found injured inside the house on the 100 block of Penn Ave. also in Souderton after a house long standoff involving SWAT. That house was the home of Nicole Hill's sister and family. The three killed include the ex-wife's sister Patricia Flick, her husband Aaron Flick, and their 14-year-old daughter Nina Flick. 17-year-old Anthony Flick was rushed to the hospital. Authorities believe this was actually the site of the first attack sometime around 3:30 a.m.
SWAT has also responded to a house near Main and W. 4th Streets in Pennsburg. That house belongs to Brad Stone. After another standoff, the suspect was not found there. Police are conducting a search for Stone in the Pennsburg area. Police have his car and cellphone. This is a continuing operation and police are still investigating all of the crime scenes. Area school districts had been on lockdowns throughout the morning. Souderton School District lifted it's lockdown before noon. Pennridge School District delayed dismissal. Again, Stone is considered armed and dangerous. Do not make contact with him, call 911 immediately. Stone is a marine veteran who spent time in Iraq and was discharged in 2011. Neighbors say that he was involved in a prolonged custody battle with his ex-wife. 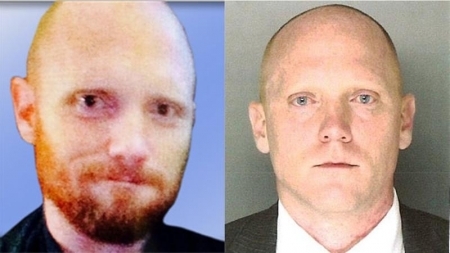 Pictured - Bradley William Stone with and without beard.